Transcranial Magnetic Stimulation (TMS) is an innovative therapy for those who have moderate to severe depression that have had trouble responding to medication. 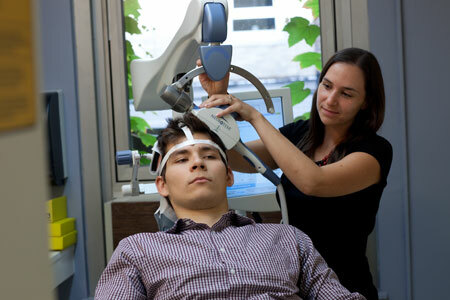 TMS works by using magnetic fields to increase or reduce specific brain activity. Using TMS allows doctors to change brain activity without surgery and with minimal discomfort to the patient. We conducted the first double blind clinical trial of TMS in depression and in our clinical program have successfully treated hundreds of patients. Patients can derive a sustained improvement in their depression, becoming able to have fulfilling lives. The FDA has cleared the NeuroStar TMS (Transcranial Magnetic Stimulation) Therapy System for the treatment of depression in individuals who have not benefited from prior antidepressant medication. Beth Israel Deaconess is proud to have been the first to offer this therapy to patients in the Boston area. In a controlled clinical trial comparing active treatment with the Neurostar TMS Therapy system to an inactive device, patients treated with active NeuroStar TMS Therapy experienced an average reduction in their depression symptoms that was more than twice the average of those receiving an inactive treatment. More importantly, individual patients can show striking benefits with complete resolution of the depression with practically no side effects. In a study most like real world clinical practice where all patients received active treatment, approximately half of the patients treated with NeuroStar TMS Therapy experienced significant improvement in their depression symptoms. About a third of the patients treated with NeuroStar TMS Therapy experienced complete symptom relief at the end of six weeks. TMS and tDCS can be applied to different brain areas with the goal of treating other conditions. Research is ongoing to determine whether these techniques are effective to treat chronic pain, epilepsy and tinnitus. The Food and Drug Administration (FDA) has not yet approved the use of TMS or tDCS for these conditions. However, TMS and tDCS can be used as "off-label" treatments, though they are considered investigational (not proven). As such, for any of these treatment indications, we do a complete neurological evaluation with all prospective patients to ensure there are no safety contraindications, and acquire informed consent to ensure that all patients are aware that the treatments are considered off-label.